Just in time for Christmas, it’s White Christmas. The Starz Filmcenter is showing a restored 35mm print for one week only. How come you’ve never seen White Christmas when you’ve seen It’s a Wonderful Life four times? Well, White Christmas isn’t the holiday classic you might think. It’s a slightly racy studio musical from 1954. The boys had intended to return to New York, but the girls are going to Vermont for a Christmas gig, and Phil convinces Bob to join the girls in Vermont, which is experiencing unseasonable weather this year. They find their old army general running the ski lodge in Vermont where the girls are to perform. Because of the weather, tourists are staying away in droves. If our heroes can’t think of a way to draw people to the lodge, their favorite general might lose his livelihood. Luckily, Bob and Phil just happen to be big Broadway performers. Et voila, we have a backstage musical. Even though the movie isn’t as memorable or moving as other holiday classics, there are plenty of reasons to see it (not the least of which are Vera-Ellen’s legs). The color is gorgeous. It was filmed in Technicolor and “VistaVision” — Paramount’s widescreen filming process that results in a negative twice as big as CinemaScope, giving the image finer detail and richer colors. Bing Crosby’s Technicolor blue eyes pop off the screen, looking beautifully unnatural. Many of the dance numbers are surprisingly good for a movie not known as a great or important musical. Fred Astaire was invited to play Kaye’s role — he and Vera-Ellen danced together in 1950’s Three Little Words — but he turned it down. Instead, Vera-Ellen dances with (and around) Kaye, giving the movie its most kinetic moments. If not for the lasting popularity of Bing Crosby’s voice singing White Christmas, this movie would have been forgotten to all but the most loyal fans of Turner Classic Movies. Instead Fate chose this average piece of eye candy for posterity. (That it was Paramount’s first film in VistaVision gives it another claim to fame.) It’s like the fly preserved in amber. There was nothing special about the fly that it deserves to be remembered today. It’s just happened to be in the right time at the right place at the right time. There were dozens of other films from the early 1950s no better and no worse than White Christmas. But if you can only see one of them on a big screen, it may as well be this one. 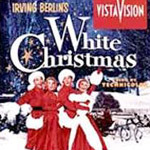 Amy Hurd: While flipping through the channels tonight, I came across this "Christmas Classic", White Christmas. I found myself listening to the "minstrel show" number and shaking my head. Those senior to me, those who grew up without gems like National Lampoon's Christmas Vacation, hang on to White Christmas fondly. It's a memory and a feeling and as much a part of Christmas as snow and apple cider. I understand the cultural phenomenon that is the genre of Christmas movie classics, and I understand that movies like White Christmas are passed down and shared with younger generations with ritual and good intentions. But, as a 29 year old, I'm uncomfortable with the idea of a "minstrel show", because it was/is racially insenstive. Movies show us the signs of the times, and, therefore, the movies themselves are not necessarily bad. But, MW, it is nothing short of absurd to suggest that stating the obvious, as Marty Mapes has done, is "digging WAY to [sic] deep." My question to you, MW, is this: In what world are you living in where no racial divides and segregation exist? Being 28 is no excuse for being ignorant.